Dewi Sartika (born in Bandung, December 4, 1884 - died in Tasikmalaya, 11 September 1947 at the age of 62 years) is a pioneering figure for women's education, was recognized as a National Hero by the Indonesian government in 1966. His father, Raden Somanagara was a freedom fighter. Finally, the father is sentenced to imprisonment Ternate island by the Dutch East Indies government to have died there. Sartika goddess born of gentry families Sunda, Nyi Raden Raden Rajapermas and Somanagara. Although violate customary at that time, his parents insisted on sending Dewi Sartika, the Dutch school anyway. After the death of his father, Dewi Sartika cared for by his uncle (mother's brother) who serves as governor in Cicalengka. From his uncle, he received instruction regarding kesundaan, whereas Western culture insights gained from education thanks to a Dutch lady Resident Assistant. Since childhood, Lady Sartika educators have demonstrated talent and perseverance to achieve progress. While playing at the back of the building kepatihan, he often demonstrated in school practice, teaching literacy, and Dutch language, to children in kepatihan maid. Chamber board the train shed, charcoal, and broken tiles maketh study aids. Raden Dewi Sartika that the education is basic in Cicalengka Seko, since childhood is already showing an interest in education. It was said, because since childhood he had fun playing the behavior of a teacher. For example, as befits the children, usually after school, Dewi small-schools have always played school with my friends girls her age, she was very happy when it acts as a teacher. When the Goddess Sartika about ten years old, when Cicalengka digemparkan by literacy and a few words in Dutch that was shown by the children kepatihan maid. Uproar, because at that time not many children (especially children of the common people) have such capabilities, and taught by a girl. Thinking that girls around him get the chance to seek knowledge, he struggled establishing schools in Bandung, West Java. At that time he was living in London. His struggle was not in vain, with the help of RAAMartanegara, grandfather, and Den Hamer, who served as Superintendent of Teaching Office, then in 1904 he succeeded in establishing a school which he called "Wife School". The school is only two classes were not sufficient to accommodate all school activities. So for a room studying, he had to borrow most of the room Kepatihan Bandung. Initially, only twenty students. Students who only taught her to count, read, write, sew, crochet, embroider and religious studies. Schools wife continues to receive positive attention from the public. Multiply disciples, even non Kepatihan Bandung who had previously borrowed is no longer enough to accommodate students. To overcome this, the School Wife was then moved to a bigger place. Over time, the six years since its founding, in 1910, the school name slightly updated to school Wife Wife Virtue. Changes not just in name only, but subjects also increases. He tried hard to educate children so that someday she could be a good housewife, could stand alone, flexible, and skilled. So for that, lessons related to construction of many household provides. To cover operational costs, he toiled for funds. All his efforts were not felt to be a burden, but it turned into the inner satisfaction of having successfully educating his people. One that adds spirit is the impetus of the various parties, especially from Raden Kanduruan Suriawinata Agah, her husband, who has helped bring the struggle, both energy and thoughts. In the following years in some areas Pasundan popping some Sakola wife, especially those run by women Sunda having the same ideals with the Goddess Sartika. In 1912 nine Sakola wife was standing in the district towns (half of the district as Pasundan). Entering the age of ten, in 1914, the school name was changed to Sakola Kautamaan Wife (School of Virtue Women). District towns Pasundan areas that do not have a wife Kautamaan Sakola stay three / four, this spirit across to Dublin, where Sakola Kautamaan wife founded by Rama Encik Saleh. The whole area has a full Pasundan Sakola Kautamaan wife in every city district in 1920, plus a few that stood in the city kewedanaan. In September 1929, held a memorial Dewi Sartika-old school establishment 25 years, which was later renamed "Raden Sakola goddess". For his services in this field, Dewi Sartika service medal awarded by the Dutch East Indies. In 1906, Goddard married to Raden Kanduruan Sartika Suriawinata Agah, someone who has the vision and ideals of the same, a teacher at the School of Coral Pamulang, which at the time was the Teacher Training School. 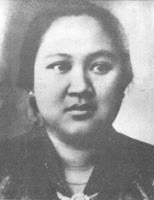 Dewi Sartika died 11 September 1947 in Tasikmalaya, and buried with a simple burial in the cemetery Cigagadon-Rahayu village Cineam District. Three years later reburied in cemetery complex in Regent Street London Karang Anyar, Bandung. Ask not what the country has given to you, but what you have given to your country. Word to the wise is very appropriate to guide all nations wishing someone named as a recipient of honors 'heroes' in the country. Regardless of the form or manner of struggle, a hero must have done something heroic for the nation according to the conditions of his time. Likewise with the Goddess Sartika Raden. If another hero waging war to the nation through such frontal lift arms, Dewi Sartika pick struggle through education, by establishing schools. Various challenges, particularly in the areas of operational funding, which he founded schools often face. But thanks to his persistence and sincerity to build the country, schools were founded as a means of education women can stand on, even a role model in other areas.